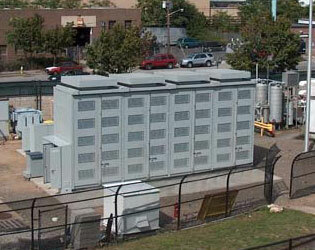 For the past few decades, Sandia and DOE have been jointly involved in Energy Storage through the ESS Program. Ever mindful of the world-wide importance of balanced, efficient, electrical grid systems, ESS has worked in concert with industry, academia, and both state and national governments in the promotion and evolution of storage technologies and systems. Projects with those entities include the Small Business Innovative Research Program (SBIR) Awards; and collaborations and partnerships between DOE and various State energy organizations, as well as DOE’s industry and academic contracts. All of these activities are monitored by the storage experts at Sandia National Laboratories. Storage technologies and related systems range from standard lead-acid batteries to superconducting flywheels, ultra capacitors, compressed air energy storage (CAES), lithium-ion cells … and beyond. Both current and completed ESS projects reflect the in-depth nature of US involvement in the importance of energy storage. At appropriate stages and at the completion of a project, the principals involved produce a formal report. Electronic copies of these reports (dating back to 1986) are publicly available for downloading, at no charge. CEC/DOE Collaboration on Energy Storage: The collaboration is a partnership between the DOE ESS Program and the California Energy Commission (CEC) to demonstrate electrical energy storage as a technically viable, cost-effective, and broadly applicable option for increasing the reliability and electric energy management of the California electricity system. In response to a CEC Program Opportunity Notice, three major projects totaling $9.6M were selected. Supercapacitors, zinc-bromine batteries, and flywheels are the technologies represented. DOE, through Sandia National Laboratories, oversees the technical management of these demonstration projects, which includes data collection, analysis, and performance monitoring by EPRI-Solutions. NYSERDA/DOE Joint Energy Storage Initiative: The initiative is a partnership between the DOE ESS Program and the New York State Energy Research and Development Authority (NYSERDA) to demonstrate electrical energy storage as a technically viable, cost-effective, and broadly applicable option for increasing the reliability and electric energy management of the New York electricity system. In response to a NYSERDA Program Opportunity Notice, six projects totaling $5.6M were selected. They include three major demonstration projects that showcase flywheel, sodium-sulfur battery, and lead-acid battery technologies. DOE, through Sandia National Laboratories, oversees the technical management of these demonstration projects, which includes data collection, analysis, and performance monitoring by EnerNex at multiple sites in New York. All NYSERDA energy storage project reports are available on the NYSERDA R&D Technical Reports Electric Power Delivery webpage. Clean Energy States Alliance (CESA): A goal of DOE OE is to develop ongoing partnerships with state entities focused around energy storage. This project is to develop that relationship with state energy groups as well as develop energy storage demonstration projects in conjunction with these groups. States currently collaborating with or trying to initiate collaborations include: Alaska, Connecticut, Pennsylvania, Texas, South Carolina and New York.